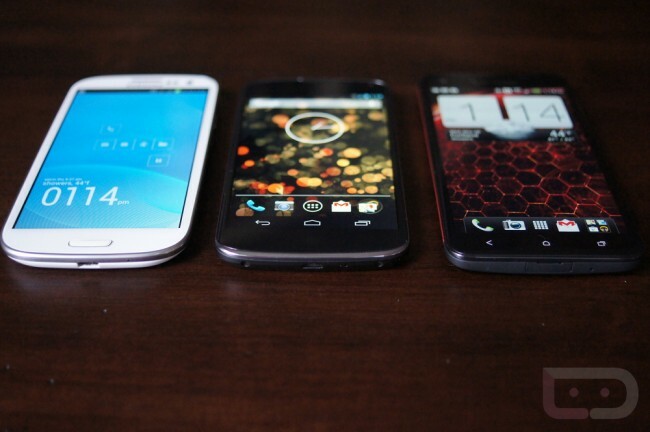 A long time ago, in our reviews, we started posting up comparison macro pictures of icons from two different devices. It wasn’t always to show which device reigned supreme, but more of a way to show off the different display techs being used, how far the technology has come over the years, and how many pixels display manufacturers were beginning to pack inside. When the HTC DROID DNA was announced with its 1080p display and 440ppi, blowing all previous displays out of the water, we couldn’t wait go get it in our possession so that we could finally go up-close-and-personal with those 5-inches of glory. Below, we took the 3 hottest phones on the planet right now (Galaxy S3, Nexus 4, and DNA), zoomed in, snapped, and put together this comparison of the Gmail icon from each phone. Since each device uses a different different display, you’ll notice the differences almost immediately. The HTC DROID DNA sports a 5″ Super LCD 3 (1920×1080 at 440ppi). The LG Nexus 4 sports a 4.7″ True HD IPS LCD (1280×768 at 320ppi). The Samsung Galaxy S3 sports a 4.8″ HD Super AMOLED (1280×720 at 306ppi). To the naked eye, all of these displays look great. But man, under a macro lens, how can you not be impressed by the DNA? HTC Hires New Chief Marketing Officer, Benjamin Ho to Launch "Marketing 2.0"